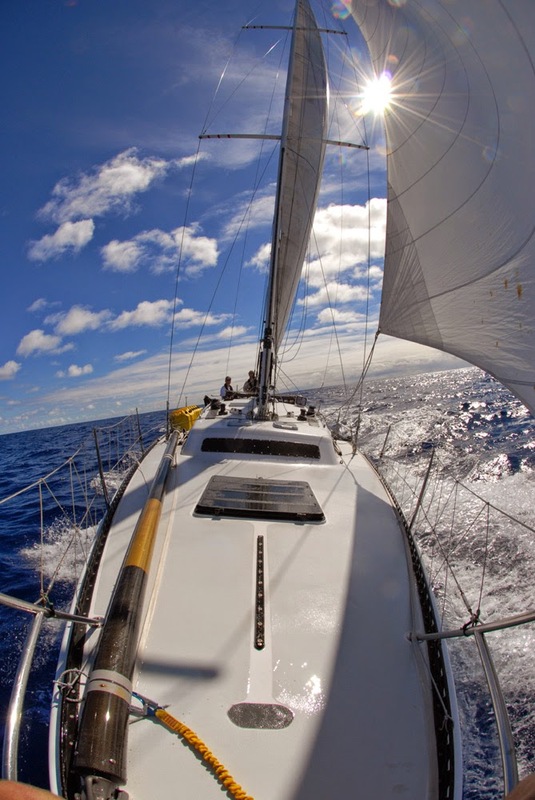 Come join J World aboard a turboed 50 footer for the West Coast classic Newport to Cabo Race. In March of 2015, six clients and three J World coaches will crew the legendary Hula Girl down the coast from California to sunny, happy Cabo San Lucas. If you want to gain valuable offshore experience, or just have a great time racing aboard a grand-prix ULDB sled, this is a rare opportunity. Everyone aboard gets to take turns at doing everything, including driving. The environment will be fun, positive, and conducive to learning… and we’ll of course work hard to achieve a great finish! Limited berths available. Visit here for more info, or call/email us for a copy of the Team Brief. 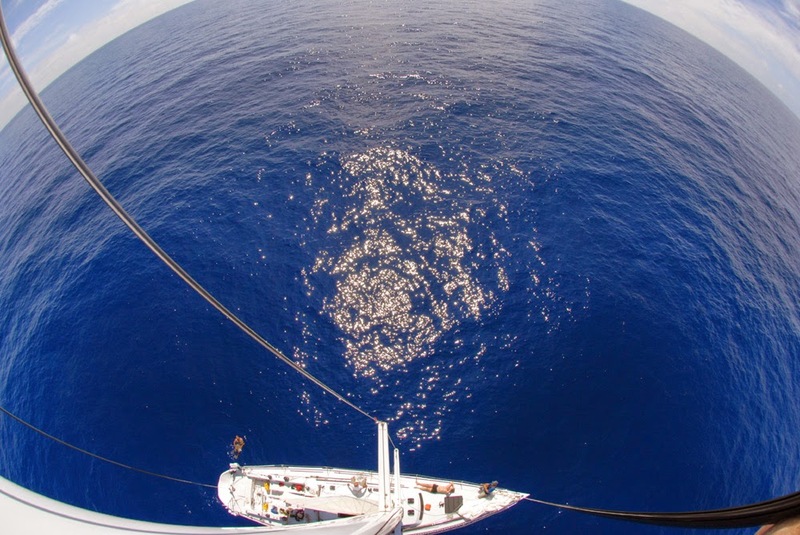 http://sailing-jworld.com/wp-content/uploads/2014/08/Newport-Cabo-Race.gif 157 217 jworld http://sailing-jworld.com/jworldwp/wp-content/uploads/2015/01/Header-Logo.gif jworld2014-08-28 16:06:002015-01-05 19:18:07Newport to Cabo Race! 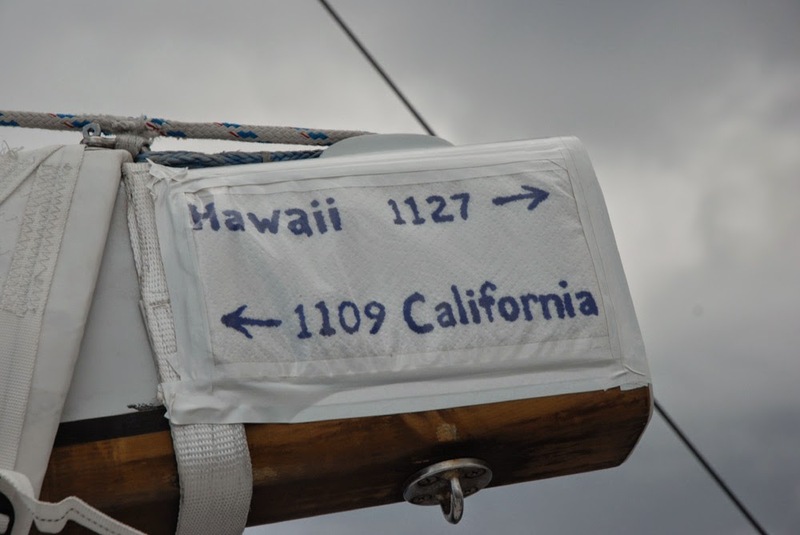 The reports from Hula Girl in her offshore cruise from Hawaii to California continue to roll in. They are well into the Pacific High, looking for the eastern side of it and the fresh breezes there to take them home. It seems with all of the hurricanes, tropical depressions and typhoons stirring to the south of us there is just no wind left for us folks sailing up north! We have lost count as to how many hours we have been motoring – the log knows but I can’t stand to look. Right now we are humming along at 8.5 KT and the sea is glassy. When I say no wind I really mean no wind. Let’s hope something changes soon. Jasper assures us that there will be wind in our future. So far he has not let us too far astray so we continue to trust his prediction, but we are formulating a back-up plan… If we can make it to the 400 mile mark off-shore we are hoping the coast guard can do a Gordo’s burrito air drop to us. The fishing gods are taunting us daily. Today we had what looked like two medium sized tuna jumping out of the water right by our lures chasing each other but not the wonderful faux food we had to offer. Tonight looks like another pasta night. If you need to find us try 35 23.627 by 135 11.651 and please bring some fresh vegetables…. Well, we had an eventful day today. It started with calm seas and the need to motor then we hit a pile of submerged fishing nets/ropes – it wrapped our prop and then the fun began. We spent the next hour cutting and clearing the prop. Three of us went in to take turns being effectively keel hauled. I went out to haul in our sea anchor (a ton of fishing nets/roped stuck to our fishing line – felt like I was hauling in a 100 pound fish) but it did stop the boat from drifting. Ultimately Jasper needed to be kicked out of the water since he stabbed himself (minor injury but we preferred no blood in the water – nice traveling with a nurse and MD). And Chris methodically continued to saw away at the mess below the waterline. After an hour we were free again and more importantly the motor still worked – good as ever. Now we are making about 8.5 KT on the rhumb line for home! Seas are glassy, the moon just set and there is no wind. Let’s hope for no more trash encounters this evening. Mid-Pacific: out here, you are farther from dry land than you can get anywhere else on the planet. The fish we hooked today got away, which was a mighty disappointment, but we try again in the morning. The menu has taken a hit as the fishing has slowed and the rations have dwindled…hope for better culinary news tomorrow. Hope all is well on the mainland! We did not fish today since the ice box is full of the last fish family we wiped out. And to make fishing matters worse we have other foods that need to be consumed so this evening’s menu was beef and rice stuffed cabbage rolls with carrots and sour cream. It is a Bosnian dish and if you have any reservations talk to Jasper who is now a believer in all things cabbage. Well now as for wind – today was a pleasant surprise. 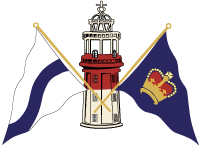 While the wind stayed below 10KT we were able to average 6.5KT sailing throughout most of the day following the rhumb line (49 degrees). And we calculated our fuel usage and remaining fuel – we are golden. Definitely not planning on going too far south. Even as we make eastward progress we are planning on motoring north when we hit the high then dropping down to SF when we leave the high. We downloaded our weather and wind this morning so we are good to go. FYI 30 34.606 by 148 05.474. This is Sparky signing off. Other than that we again visited a lovely fish and vegetable curry over rice – tomorrow we will have morally recovered enough to fish again! I shall do the tuna dance before casting our lines and hope the tuna gods are listening. Other than that Jasper would like to report that the floggings continue…now let’s see if you can figure out who is flogging whom…. Sparky is signing off to go learn something about the stars. The wind has been holding between 80-120 degrees but usually not making it past 8 KT (and the 8 only last about 15-20 minutes at best) – with that we have been motoring a lot today but getting our exercise putting the jib up, then down, then up, then down, and on and on. Sparky is back in the saddle. After letting a HUGE one slip away on the sugar scoop (almost dove in after it – the crew is all on high alert for Sparky overboard if there is a blue fin in question) this morning we were able to hook two magnificent Mahi Mahi at the same time and land both! We had Chris on one hand line and me on the other – it was beautiful! The fish are getting bigger to boot – one was about 20lbs the other just under 15lbs. We have fish for days!!! We started lunch with a lovely tartar with capers and red onion etc… followed by crispy fried fish tacos with Bosnian style slaw. Heaven! Then we went for a fish and fresh vegetable coconut curry over rice for dinner – thank goodness we are a spicy boat. Soon we will start experimenting with the dessert menu. 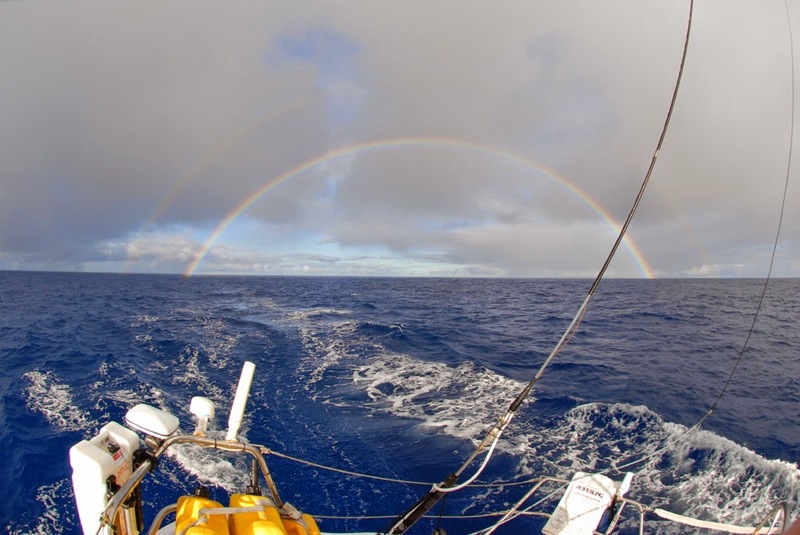 We just hit 8 KT sailing – HOT DAMN – San Francisco here we come!! !